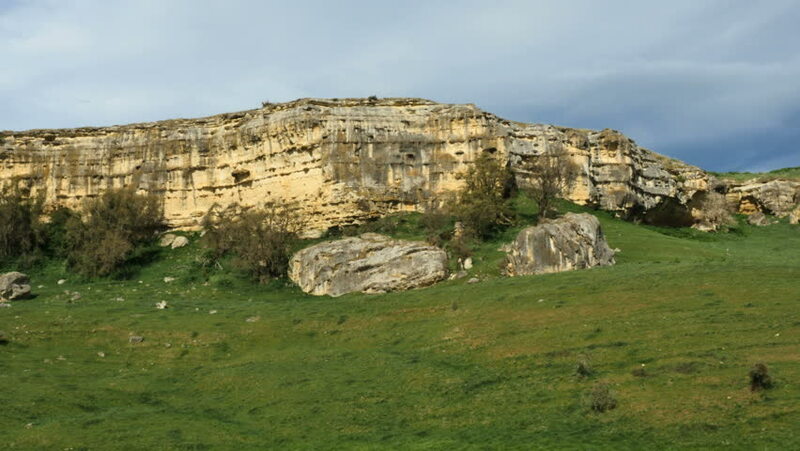 Rocks lie on a slope in front of an eroding sandstone cliff. 4k00:13Leaves frame a view of cliffs beyond Una lagoon. hd00:12Flying balloons over Cappadocia Turkey. Cappadocia, with its valleys, gorges, hills, located between the volcanic mountains in Goreme National Park. hd00:34Aerial View: Chufut-Kale fortress. Mountain plateau of Burunchak, near Bakhchisaray. Kacha river canyon. Crimea. Autumn 2013.